PRESIDENT TRUMP: Thank you very much. Thank you. Please be seated. Vice president Pence, Secretary of State Tillerson, members of the cabinet, General Dunford, Deputy Secretary Shanahan, and Colonel Duggan. Most especially, thank you to the men and women of Fort Meyer and every member of the United States military at home and abroad. We send our thoughts and prayers to the families of our brave sailors who were injured and lost after a tragic collision at sea as well as to those conducting the search and recovery efforts. I am here tonight to lay out our path forward in Afghanistan and South Asia. But before I provide the details of our new strategy, I want to say a few words to the service members here with us tonight. To those watching from their posts, and to all Americans listening at home. Since the founding of our republic, our country has produced a special class of heroes whose selflessness, courage, and resolve is unmatched in human history. American patriots from every generation have given their last breath on the battlefield - for our nation and for our freedom. Through their lives, and though their lives - were cut short, in their deeds they achieved total immortality. By following the heroic example of those who fought to preserve our republic, we can find the inspiration our country needs to unify, to heal and to remain one nation under God. The men and women of our military operate as one team, with one shared mission and one shared sense of purpose. They transcend every line of race, ethnicity, creed, and color to serve together and sacrifice together in absolutely perfect cohesion. That is because all service members are brothers and sisters. They are all part of the same family. It’s called the American family. They take the same oath, fight for the same flag, and live according to the same law. They are bound together by common purpose, mutual trust, and selfless devotion to our nation and to each other. The soldier understands what we as a nation too often forget, that a wound inflicted upon on a single member of our community is a wound inflicted upon us all. When one part of America hurts, we all hurt. And when one citizen suffers an injustice, we all suffer together. Loyalty to our nation demands loyalty to one another. Love for America requires love for all of its people. When we open our hearts to patriotism, there is no room for prejudice, no place for bigotry, and no tolerance for hate. The young men and women we sent to fight our wars abroad deserve to return to a country that is not at war with itself at home. We cannot remain a force for peace in the world if we are not at peace with each other. As we send our bravest to defeat our enemies overseas, and we will always win, let us find the courage to heal our divisions within. Let us make a simple promise to the men and women we ask to fight in our name, that when they return home from battle, they will find a country that has renewed the sacred bonds of love and loyalty that unite us together as one. Thanks to the vigilance and skill of the American military, and of our many allies throughout the world, horrors on the scale of September 11, and nobody can ever forget that, have not been repeated on our shores. But we must acknowledge the reality I am here to talk about tonight, that nearly 16 years after September 11 attacks, after the extraordinary sacrifice of blood and treasure, the American people are weary of war without victory. Nowhere is this more evident than with the war in Afghanistan, the longest war in American history - 17 years. I share the American people's frustration. I also share their frustration over a foreign policy that has spent too much time, energy, money, and most importantly, lives trying to rebuild countries in our own image instead of pursuing our security interests above all other considerations. That is why shortly after my inauguration, I directed Secretary of Defense Mattis and my national security team to undertake a comprehensive review of all strategic options in Afghanistan and South Asia. My original instinct was to pull out, and historically I like following my instincts. But all my life, I have heard that decisions are much different when you sit behind the desk in the oval office. In other words, when you are president of the United States. So I studied Afghanistan in great detail and from every conceivable angle. After many meetings over many months, we held our final meeting last Friday at Camp David with my cabinet and generals to complete our strategy. I arrived at three fundamental conclusion about America's core interests in Afghanistan. First, our nation must seek an honorable and enduring outcome worthy of the tremendous sacrifices that have been made, especially the sacrifices of lives. The men and women who serve our nation in combat deserve a plan for victory. They deserve the tools they need and the trust they have earned to fight and to win. Second, the consequences of a rapid exit are both predictable and unacceptable. 9/11, the worst terrorist attack in our history, was planned and directed from Afghanistan because that country by a government that gave comfort and shelter to terrorists. A hasty withdrawal would create a vacuum that terrorists, including ISIS and al Qaeda, would instantly fill, just as happened before September 11. And as we know, in 2011, America hastily and mistakenly withdrew from Iraq. As a result, our hard-won gains slipped back into the hands of terrorists enemies. Our soldiers watched as cities they had fought for bled to liberate and won were occupied by a terrorist group called ISIS. The vacuum we created by leaving too soon gave safe haven for ISIS to spread, to grow, recruit and launch attacks. We cannot repeat in Afghanistan the mistake our leaders made in Iraq. Third and finally, I concluded that the security threats we face in Afghanistan and the broader region are immense. Today, 20 U.S.-designated foreign terrorist organizations are active in Afghanistan and Pakistan. The highest concentration in any region anywhere in the world. For its part, Pakistan often gives safe haven to agents of chaos, violence, and terror. The threat is worse because Pakistan and India are two nuclear-armed states, whose tense relations threat to spiral into conflict, and that could happen. When I became president, I was given a bad and very complex hand, but I fully knew what I was getting into. Big and intricate problems. But one way or another, these problems will be solved. I am a problem solver. And in the end, we will win. We must address the reality of the world as it exists right now, the threats we face, and the confronting of all of the problems of today, an extremely predictable consequences of a hasty withdrawal. We need look no further than last week's vile, vicious attack in Barcelona to understand that terror groups will stop at nothing to commit the mass murder of innocent men, women, and children. You saw it for yourself. Horrible. As I outlined in my speech in Saudi Arabia, three months ago, America and our partners are committed to stripping terrorists of their territory, cutting off their funding and exposing the false allure of their evil ideology. Terrorists who slaughter innocent people will find no glory in this life or the next. They are nothing but thugs and criminals and predators, and, that’s right, losers. Working alongside our allies, we will break their will, dry up their recruitment, keep them from crossing our borders, and yes, we will defeat them, and we will defeat them handily. In Afghanistan and Pakistan, America's interests are clear. We must stop the resurgence of safe havens that enable terrorists to threaten America. And we must prevent nuclear weapons and materials from coming into the hands of terrorists and being used against us or anywhere in the world, for that matter. But to prosecute this war, we will learn from history. As a result of our comprehensive review, American strategy in Afghanistan and South Asia will change dramatically in the following ways: A core pillar of our new strategy is a shift from a time-based approach to one based on conditions. I’ve said it many times, how counterproductive it is for the United States to announce in advance the dates we intend to begin or end military operations. We will not talk about numbers of troops or our plans for further military activities. Conditions on the ground, not arbitrary timetables, will guide our strategy from now on. America's enemies must never know our plans or believe they can wait us out. I will not say when we are going to attack, but attack we will. Another fundamental pillar of our new strategy is the integration of all instruments of American power, diplomatic, economic, and military, toward a successful outcome. Someday, after an effective military effort, perhaps it will be possible to have a political settlement that includes elements of the Taliban and Afghanistan, but nobody knows if or when that will ever happen. America will continue its support for the Afghan government and the Afghan military as they confront the Taliban in the field. The next pillar of our new strategy is to change the approach in how to deal with Pakistan. We can no longer be silent about Pakistan's safe havens for terrorist organizations, the Taliban, and other groups that pose a threat to the region and beyond. Pakistan has much to gain from partnering with our effort in Afghanistan. It has much to lose by continuing to harbor criminals and terrorists. In the past, Pakistan has been a valued partner. Our militaries have worked together against common enemies. The Pakistani people have suffered greatly from terrorism and extremism. We recognize those contributions and those sacrifices, but Pakistan has also sheltered the same organizations that try every single day to kill our people. We have been paying Pakistan billions and billions of dollars, at the same time they are housing the same terrorists that we are fighting. But that will have to change. And that will change immediately. No partnership can survive a country's harboring of militants and terrorists who target U.S. service members and officials. It is time for Pakistan to demonstrate its commitment to civilization, order, and to peace. Another critical part of the South Asia strategy or America is to further develop its strategic partnership with India, the world's largest democracy and a key security and economic harbor of the United States. We appreciate India's important contributions to stability in Afghanistan, but India makes billions of dollars in trade with the United States, and we want them to help us more with Afghanistan, especially in the area of economic assistance and development. We are committed to pursuing our shared objectives for peace and security in South Asia and the broader Indo-Pacific region. Finally, my administration will ensure that you, the brave defenders of the American people, will have the necessary tools and rules of engagement to make this strategy work and work effectively and work quickly. I have already lifted restrictions the previous administration placed on our war fighters that prevented the secretary of defense and our commanders in the field from fully and swiftly waging battle against the enemy. Micromanagement from Washington, D.C., does not win battles. They are won in the field drawing upon the judgment and expertise of wartime commanders and frontline soldiers, acting in real time with real authority and with a clear mission to defeat the enemy. That is why we will also expand authority for American armed forces to target the terrorists and criminal networks that sow violence and chaos throughout Afghanistan. The killers need to know they have nowhere to hide, that no place is beyond the reach of American might and American arms. Retribution will be fast and powerful. As we lift restrictions and expand authorities in the field, we are already seeing dramatic results in the campaign to defeat ISIS, including the liberation of Mosul in Iraq. Since my inauguration, we have achieved record-breaking success in that regard. We will also maximize sanctions and other financial and law enforcement actions against these networks to eliminate their ability to export terror. When America commits its warriors to battle, we must ensure they have every weapon to apply swift, decisive, and overwhelming force. Our troops will fight to win. We will fight to win. From now on, victory will have a clear definition. — attacking our enemies, obliterating ISIS, crushing al Qaeda, preventing the Taliban from taking over Afghanistan, and stopping mass terror attacks against America before they emerge. We will ask our NATO allies and global partners to support our new strategy, with additional troop and funding increases in line with our own. We are confident they will. Since taking office, I have made clear that our allies and partners must contribute much more money to our collective defense, and they have done so. In this struggle, the heaviest burden will continue to be borne by the good people of Afghanistan and their courageous armed forces. As the prime minister of Afghanistan has promised, we are going to participate in economic development to help defray the cost of this war to us. Afghanistan is fighting to defend and secure their country against the same enemies who threaten us. The stronger the Afghan security forces become, the less we will have to do. Afghans will secure and build their own nation and define their own future. We want them to succeed. But we will no longer use American military might to construct democracies in faraway lands or try to rebuild other countries in our own image. Those days are now over. Instead, we will work with allies and partners to protect our shared interests. We are not asking others to change their way of life but to pursue common goals that allow our children to live better and safer lives. This principled realism will guide our decisions moving forward. Military power alone will not bring peace to Afghanistan or stop the terrorist threat arising in that country. But strategically-applied force aims to create the conditions for a political process to achieve a lasting peace. America will work with the Afghan government as long as we see determination and progress. However, our commitment is not unlimited, and our support is not a blank check. The government of Afghanistan must carry their share of the military, political, and economic burden. The American people expect to see real reforms, real progress, and real results. August 22, 2017 "Information Clearing House" - President Donald Trump acknowledged on Monday night that the new Afghanistan strategy he unveiled is a reversal of his long-held objection to the very idea of having a U.S. military presence in the country. But in announcing a ramp up of U.S. forces with no defined timeline for their departure, Trump tailored and mangled and obscured the policy to such a degree so as to make it both difficult to understand and—he hopes—palatable to his base. At one point, he asserted that his strategy was to have no publicly-stated strategy at all. “We will not talk about numbers of troops or our plans for further military activities,” Trump told a crowd of servicemen at Virginia’s Fort Myer on Monday. President’s have made abrupt foreign policy reversals before, often breaking with campaign pledges when presented with a new set of geopolitical realities. Trump’s reversal stands out not just for the outright vehemence with which he previously argued that America needed to put an end to its 16-year-long war—Trump has called for total US withdrawal from Afghanistan and for handing the country over to an army of mercenaries—but also because of what it says about his foreign policy at large. In the seven months since taking office, Trump has expanded military operations in Yemen, Syria, Iraq, Somalia, Libya and, now, Afghanistan. And that’s in addition to an escalated nuclear standoff with North Korea. And so, when pitching the notion that the time had come to enlarge America’s military presence, the president used a variety of different selling points to re-frame the context. This was, he stressed, an agenda based on counter-terrorism principles and devoting American blood and treasure purely to the country’s first-order military interests. It was “America First” rhetoric plastered atop a military-oriented interventionist policy. And it was done, ostensibly, to ensure that Trump’s base, disillusioned with decades of Republican-led foreign policy adventurism, heard someone who remained skeptical. “Why did we even have an election?” wondered Mike Cernovich, a popular far-right internet media personality generally supportive of Trump. He mockingly tweeted a photo of a flak jacket-clad Jared Kushner, the president’s senior adviser and son-in-law, during a trip to Afghanistan this year, with the caption “General Jared.” In another tweet, he wrote, “Congratulations to President McMaster!” a derisive reference to White House National Security Adviser H.R. McMaster, who pressed the president to boost troop levels in Afghanistan. The pushback that came after Trump’s speech was apparent in the process leading up to it as well. Inside the White House, the draw-down and ramp-up camps battled over the president’s plan, in an internal debate that contributed to the departure last week of White House chief strategist Steve Bannon, the West Wing’s most vocal critic of escalation in Afghanistan. Bannon returned to Breitbart News, the prominent right-wing website that has favorably covered Trump for years. 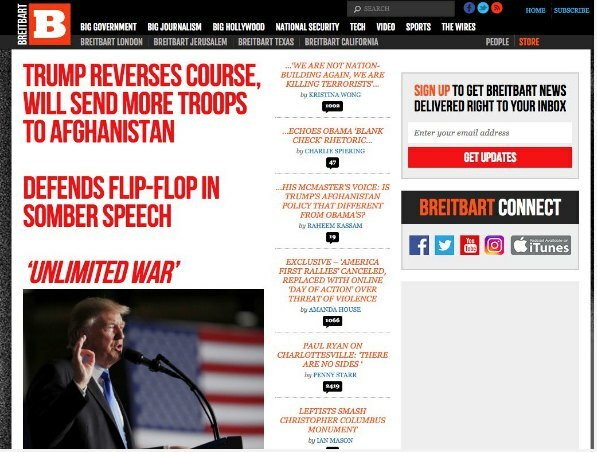 And in the run-up to Trump’s speech on Monday evening, as details of the troop surge announcement trickled out, Breitbart’s coverage ranged from skeptical to hostile. “America First? With Steve Bannon Out, Globalists Push For More War Abroad” read one headline. After Trump’s speech concluded, the lead story on Breitbart’s homepage braced readers for “UNLIMITED WAR.” (The site later took that headline down). Bannon, Cernovich, and other elements of Trump’s less interventionist political base hoped for foreign policy more in tune with the president’s pre-White House rhetoric, when he dubbed the war in Afghanistan “a total disaster” and “a complete waste” and repeatedly called on President Barack Obama to withdraw U.S. forces completely. Sen. Rand Paul (R-KY), one of the few elected Republicans to echo this hope, was critical of Trump even before he spoke. "The mission in Afghanistan has lost its purpose and I think it is a terrible idea to send any more troops into that war,” Paul said in a statement. In a rare bit of self-reflection, Trump explained that the reason he changed his tune on Afghanistan was precisely because of the weight of his office. “[A]ll my life I have heard decisions are much different when you sit behind the desk in the Oval Office,” he said. And he tried to couch the shift by repeatedly invoking the possibility of another attack homeland. Twice, Trump referenced the attacks from September 11, 2001. “A hasty withdrawal would create a vacuum that terrorists—including ISIS and Al Qaeda—would instantly fill,” he said. But instead of placating his base, Trump ended up drawing plaudits from an unfamiliar crowd.